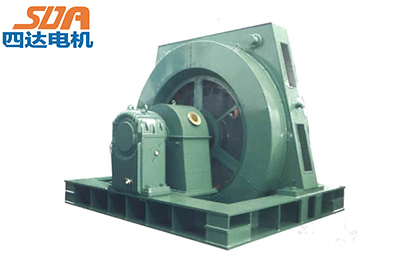 T series synchronous motor are applied to drive fan,water pump,motor-generatoe set and other universal machines.Their rated voltage is 10000V or 6000V as the customer request.The frequency is 50 Hz.The rated power factor is 0.9(leading).The motor is allowed to be started directly at full voltage .The rotor circuit should be series connected with a starting resistor with ten times resistance of field winding resistance during strating. T series synchronous motor are of horizontal.Their cooling mode can be open self-ventilation,duct or half duct ventilation,or enclose self-circulating ventilation.T series synchronous motor can have one shaft endirection as see from the ring collector.The rotation direction can be changed,but the fan should be changed accordingly. Frame:Integral constrution welded by steel plate.The frame and plain bearing housing are fixed on the base by steel plate respectively. Stator iron core:Laminated by 0.5mm silicon steer lamination.The stator iron core is fixed on the frame by tighting screw ordoetail rib. Stator iron core:Laminated by 0.5mm silicon steer lamination.The stator iron core is fixed on the frame by tighting screw ordoetail rib. Stator coil:The coil is two layer lap winding.It has class F insulaioon and can prevent the corona.The end of the coil is wrapped tightly and be integral varnished. Magnetic coil:Wound by flat copper wire and has class F insulation after be insulating treat. Bearing:Composed of cast iron plain bearing housing and plain bearing half-liner casted with alloy.The lubricating method is oilring self-lubricating or compound lubricating with outer oil system. Brush and collector ring:The collector rings construction is assembling.The brush is fixed in the constant voltage brush box and connected by the conducting plate.The whole brushis fixed on the side of bearing. Exciting mode:T series synchronous electrical machines are excited by quiescent controllable exciting.The exciting unit can be procided by the manufactroy.